The Practicing Advocates Bar Association of Chhattisgarh has started a Lecturer Series as an innovative measure for the upliftment of the junior lawyers at the Bar. The first of those was conducted on 31.03.2017 which was presided over by the Hon’ble Justice Deepak Gupta, Judge, Supreme Court of India. The topic of the house was “Art of Advocacy, Client Dealing and Presentation before the Court”. 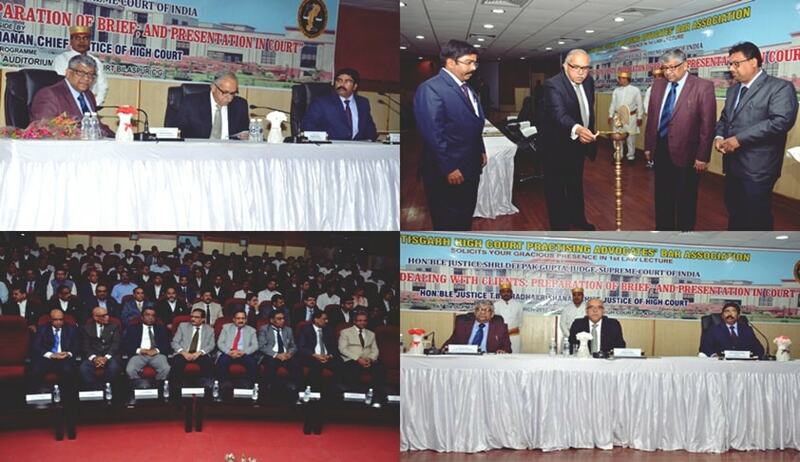 The Lecture was also presided over by the Hon'ble Chef Justice of Chhattisgarh High Court, Shri T.B. Radhakrishnan & other Hon'ble judges of the High Court, Senior Advocates, Advocates and Law Students from various colleges. Hon’ble Justice Gupta gave the inside out of how a junior lawyer should work in the initial years of his carrier. Before beginning with the topic he has specifically stressed that “To be a successful lawyer, one must be a good human being.” He delivered the lecture which is impressive and at the same time very simple and helpful for the junior lawyers and the law students. He narrated a few incidents at the time when he himself was a junior at the High Court of Himachal Pradesh at Shimla. He then went on to explain as to how a lawyer should work, the amount of dedication and hard work one has to put in. In relation to the presentation before the court he said that a lawyer should mold himself according the requirement and he should be a keen observer of the court. The best of his lecture was when he narrated about the first personal case of his life, the amount of effort and hard work that he had put in. The client is the bread and butter of a lawyer therefore a good lawyer must always respect his clients. Thereafter the house was open for questions and answers. Many questions were asked by the junior lawyers and law students. He answered them all in a very simple manner. At the last, the Bar of the Chhattisgarh High Court with a heavy heart bids the long waited farewell to its one of the most vibrant CJ’s of the High Court of Chhattisgarh.